MotoGP rider Johann Zarco seemed all set to achieve seventh position at San Marino Grand Prix on Sunday. Unfortunately, his Yamaha ran out of fuel and came to a halt soon after. Despite this, Zarco did managed to come 15th in the race as he pushed his bike to the other end of the finish line. Not only this, the French racer also managed to earn a single MotoGP point. With this, he is currently at number 6 in the championship standings. 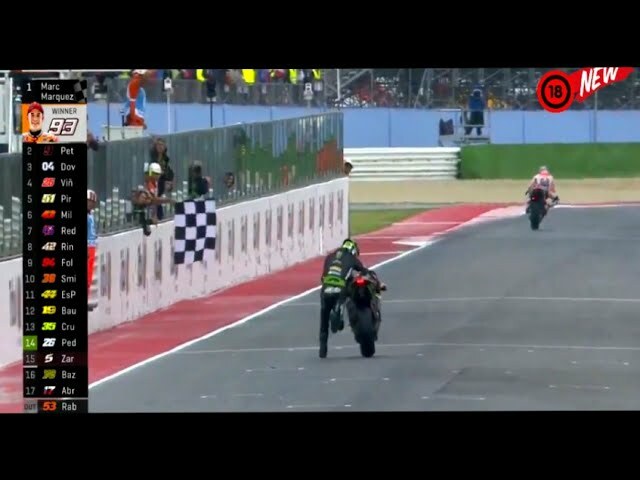 Regarding this, Johann Zarco said that from the last corner, he had to go down to his bike and run. He added that there were two lines, the start line and the finish line and the latter was really very far. While Zarco was pushing his motorcycle through the entire straightaway, the crowd cheered him up. Marc Marquez clinched the victory in the race and registered the fastest lap on the last one. With this, Marc now goes on a tie with Ducati’s Andrea Dovizioso on the overall point sheet. Commenting on his win, Marc Marquez said that in rainy conditions, it’s all unpredictable and you never know what could happen next. He further added that he was trying to control the race and himself as he could be a little bit faster. He thought of being patient and for a moment, decided to stay content with the second position. Just when he entered the last lap, he told himself to try. The rider said that the championship is indeed tight and five points can actually mean a lot in the end. Nine time MotoGP world champion Valentino Rossi missed the race due to an off-road accident a couple of weeks back when he fractured his leg. At the time of mishap, the doctors had revealed that Rossi will need at least 30 to 40 days to recover. Having said that, the MotoGP sensation will not be able to get on the bike before Japanese MotoGP starting 15th October.